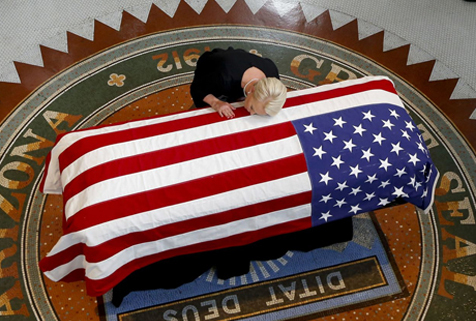 John Sidney McCain III (August 29, 1936 – August 25, 2018) was an American politician and military officer who served as a United States Senator from Arizona from 1987 until his death in 2018. He previously served two terms in the United States House of Representatives and was the Republican nominee for President of the United States in the 2008. We all pray for the family of Senator McCain for the loss of a husband, father and friend. He was a great man that we all honor. This man and this funeral remind us of how great our country is. He was a great patriot and statesman who defended our countries greatness. Today we honor him as well as all those that died defending our United States of America.